Cold Morning…….Fishing High Water Too…. Thurs…..Dec.29,2011…….A very, very cold start to the day. It was 28-30F when we arrived , a heavy frost and some frozen puddles along the river. Guided Randy Harris and his son Marshall……We rigged up and started with Y2Ks and a small nymph or midge dropper. We caught fish on those and also on a dead squirrel streamer with a glass bead Ginny Midge dropper. We caught probably a dozen to 15 fish before lunch. We then headed to another spot and caught about a dozen more , for about 25-30 on the day. The best fish of the day was a citation sized rainbow , a real beast landed by Randy that was about 22". It decided eating one of my dead squirrel Buggers in black was a good idea….. The water was still high from recent rains and I know there were a lot of places that were still unfishable today. Fortunately we found clear, fishable water. Had a guided trip scheduled tomorrow on one of our private waters but things are still high and dirty. Thurs….Dec. 29, 2011…..I hope the waders still fit after all the eating…lol. Good morning , headed out this morning guiding Randy Harris and his son Marshall. We will find high water I am sure…its been really wet in the hills. Have a great morning will have a report from the water later this morning….. Fly Tying Madness is Here….! Wed….Dec. 28, 2011……Well, for some of us the madness is 365 days a year! 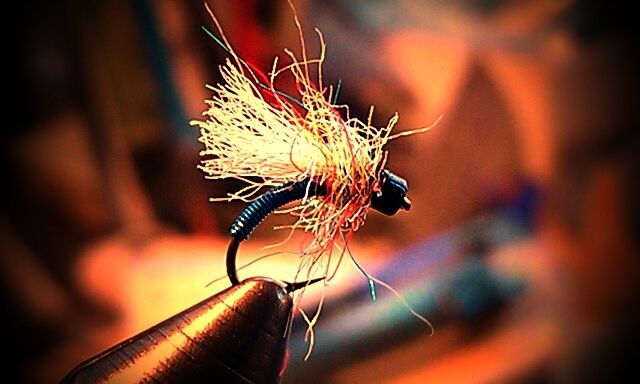 I love fly tying, never lose the passion for it. Just finished some lessons the past two days, will be gearing up for more. I have developed a new ‘private lesson program’ that is fly specific and river specific. I will be putting out the new list of offerings in the coming week. 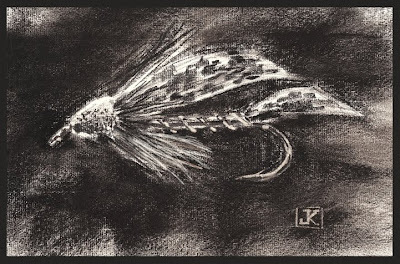 Here’s a video clip I did with two of my longtime friends at FOX 8 , David Weatherly and Roy Ackland, whose work on the program feature Roy’s Folks….let’s do some fly tying…. Wed…..Dec.28, 2011……. Good mornin.g friends, hope your Christmas holiday has been a great one. 2011 will go down as my best year ever and I thank each of you for being a part of it. Looks like the weather is turning back cool, and the NC high country is white this morning with a few inches of fresh fallen snow. A surprise it is that we have not had any white stuff yet, at least enough to amount to anything. I remember just last year showing up on the North Fork of the New River and Helton Creek and there being a 5-6 foot wall of ice and snow on the edge of the stream, making just getting in the water an issue. What a difference….. The recent rains have many places swollen and unfishable after yesterday’s rains. A lot of areas got up to 2 inches of rain while almost all got at least an inch. I am headed out tomorrow, and its a coin toss as far as the conditions go. But we will give it a shot nonetheless. 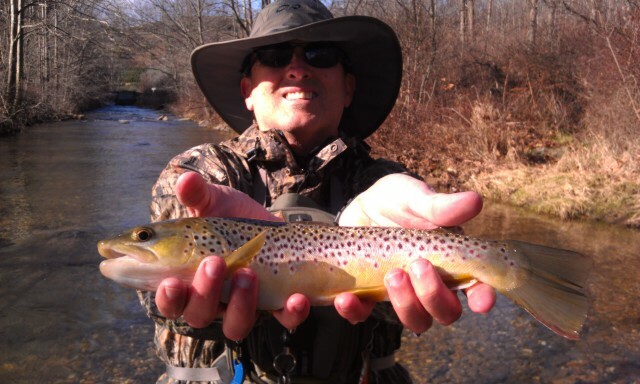 I will be guiding Randy Harris from Winston-Salem, NC, and we will be nymphing and streamer fishing. Have a great day today and we will resume with fishing reports from the water tomorrow. Good Day of Fishing, Just Beat the Rain…..
Thurs….Dec. 22, 2011….Just escaped some really heavy rain…Guided Mike Riley, Cary, NC, and we had a good day, probably landing 20-25 rainbows and brookies on a variety of nymphs….mostly size 20-24 midge patterns and tiny baetis nymphs more akin to fishing tailwater rivers. The water was still low and clear when we started this morning but I doubt it will be so after tonight. What appeared to be a benign system is dumping some healthy rains and we drove in it much of the way. All in all its a good thing as we badly needed the rain to keep river levels up. Hope your day was grand and have a great evening…. Tues……Dec.20, 2011……The skies are darkening and storm clouds are rolling in. 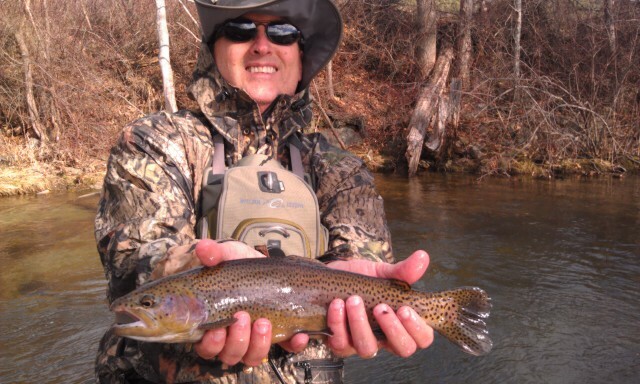 Guiding Fred Gebarowski and the fishing is pretty good….what a difference cloudy skies have made. We have put probably 25 fish in the net, almost all fish have been by nymphing with tiny midge patterns size 22-26. Taking a lunch break and we are headed back out fishing in a bit. Looks like some significant rain is on the way and things might make tomorrows trip soupy. Too much rain could blow us out. Tues…Dec. 20, 2011…Looks like another mild day tomorrow , had challenging fishing yesterday guiding Dr Don Lucey and his grandson Luke on a half day trip. We landed about 15 fish and worked hard for every one of them. Guiding Fred Gebarowski today and looking forward to a great day. Mon……Dec. 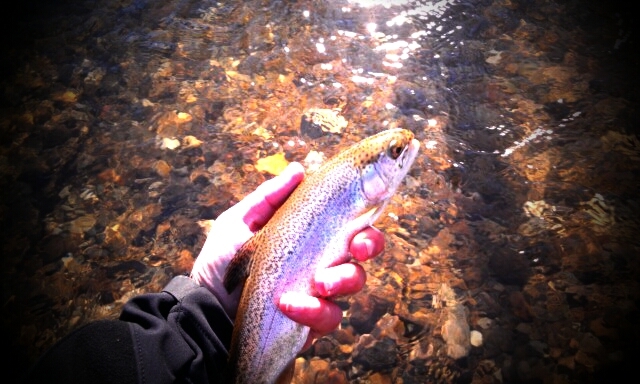 19, 2011……Warm sunny weather brought challenging fishing as water levels have dropped and water is quite clear. Guided Dr. Don Lucey and his grandson Luke on a half day trip. We nymph fished with midge patterns and caught about 15 fish, a good mix of browns, brookies, and rainbows and had a bunch of others on that came off after a short tussle…which is going to happen with light tippet and small flies. I miss the cold…! 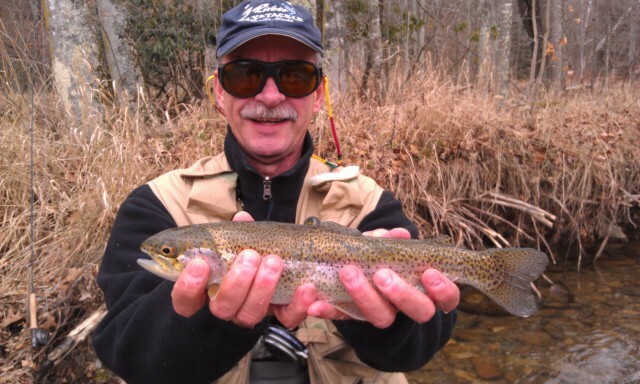 Will be guiding another trip tomorrow, Fred Gebarowski from Cary, NC. 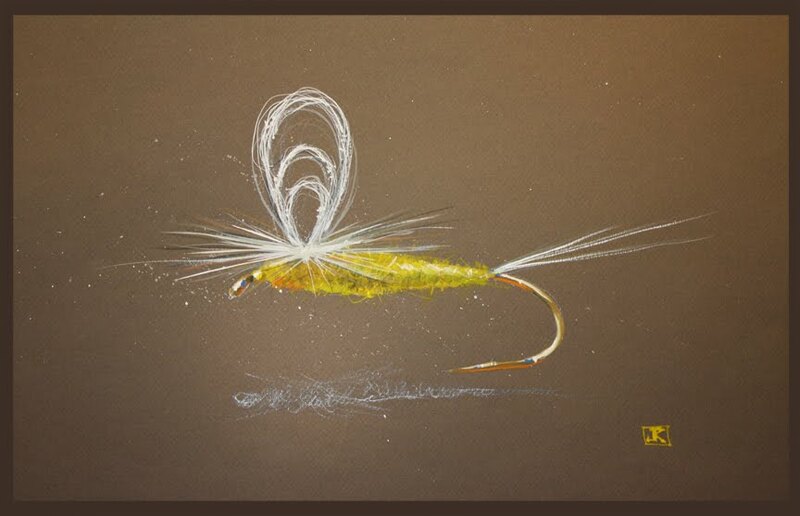 We will be doing more light tippet fishing with small flies. More to come …..have a great day! Got this out a few days late this year because we have been swamped with fly orders and Jeff has been spending too much time in the water doing trips….say what? A fly fishing guide in the water too much…..? No such thing. But anyway the mailer is out and as always I would love to help you with any gift needs I can. Guided Trips are great because the person you gift will receive a gift they will remember and value forever, and will take with them an experience they will never forget. Fishing has been good, even with the weather all over the place. I don’t know from one day to the next whether to wet wade or crack ice….lol. Well, its not that extreme but I will say fishing in shirt sleeves one day with 65F temps and two days later in upper 20s, a 20mph breeze, and spitting snow takes a little getting used to. 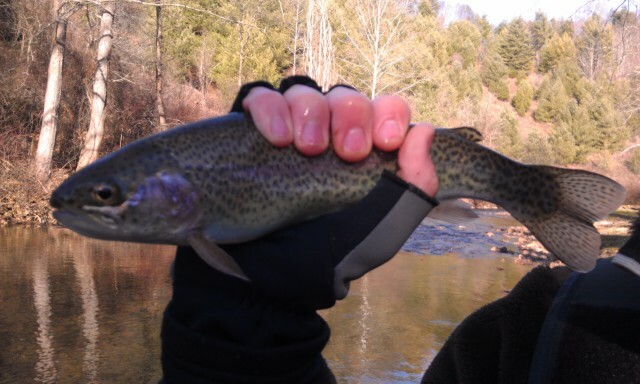 Only in the Appalachians, only in Carolina…..
We whacked some big ones yesterday, I was guiding Dr. Spencer Tilley and his son Nathan and we landed 4 citation fish, 2 rainbows and 2 browns between 18 and 24 inches. The largest fish was caught by Nathan….and it was at the end of the day…and was a bit of a redemption as we’d just broken off a fish just as large……What a day. 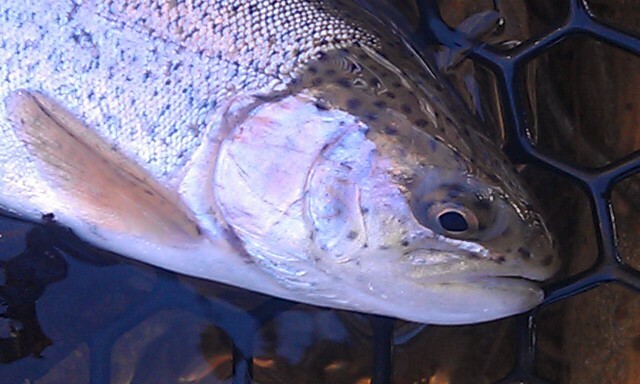 I will be guiding tomorrow, Tuesday, and perhaps Wednesday too, the first trip Dr. Don Lucey and his grandson Luke, Fred Gebarowski, and a Wednesday trip that should come through as well….should have some great fishing and some more reports as well.